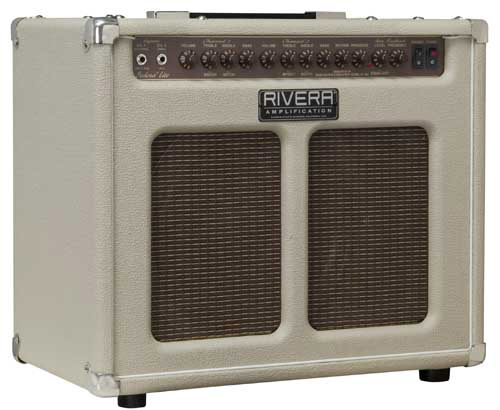 Sedona Lite DLX, Acoustic-Electric Guitar Amplifier from Rivera. The Sedona Lite DLX is an Acoustic/Electric tube combo with two clean channels, powered by a pair of EL34s, rated at 55 watts RMS. Channel 1 features a balanced input, and a full 3-band EQ, with bright and midrange notch switches designed to produce the full volume and tone of Taylor ES-equipped guitars. Channel 2 features a standard unbalanced input, also with 3-band EQ. Treble pull for bright and a Middle pull for selectable mid-range notch complete the EQ options. The Sedona Lite DLX includes an Accutronics spring reverb, and parametric anti-feedback EQ. A direct output with level control is provided, along with an active effects loop with separate send and return level controls. The 2-way speaker system, featuring a Celestion G12T-75 woofer and a high powered tweeter is tuned for balance between acoustic and electric instruments. The tweeter can be switched off when using electric instruments. A new “Split Grille” cabinet, featuring vintage style blonde Tolex is standard. 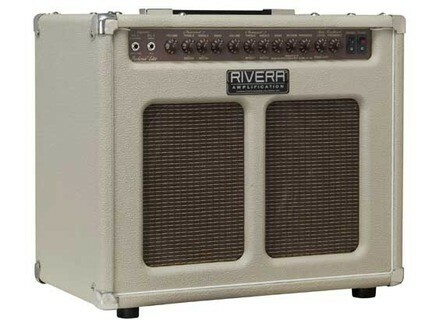 Rivera Pubster 25 Top Rivera Amplification has released its new Pubster 25 Top. New Prices on Vox Satriani Signature Models VOX Amplification announces new, lower prices on select models of VOX/Joe Satriani signature effect pedals. Win a Blackstar HT-1 Each week, between April 1st and April 30th, guitarists in the U.S. can enter to win a Blackstar HT-1 combo amp.